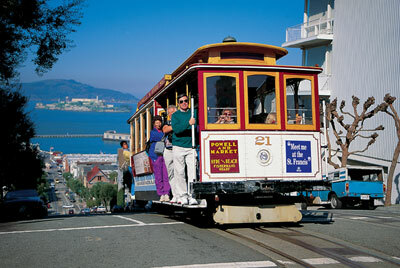 The California Street Cable Car will be closed for repairs until July 2011. This marks the first time any of the three cable car lines will be closed for an extended period since the entire system was overhauled from 1982 to 1984. As a result of the closure, I foresee more tourists flocking to the already overcrowded Powell-Hyde and Powell-Mason lines. Ride early in the morning or late at night. If you try to ride the cars before 9:00 a.m. or after 8:00 p.m., you are less likely to find long lines at the cable car turnarounds at Powell and Market Streets, Aquatic Park, and Taylor and Bay Streets. Cable car service starts at around 6:00 a.m. and concludes shortly after midnight. Don't board the cars at the turnarounds. Sometimes you can squeeze onto the cars if you try to board a few blocks from the end of the cable car lines. Better yet, board the cars at stops where many folks get off. These stops include the Cable Car Museum at Washington and Mason Streets, the Nob Hill/Chinatown stop at California and Powell Streets, and the Lombard Street (Crookedest Street in the World) stop at Hyde and Lombard Streets. Take the Powell-Mason Street Line from Fisherman's Wharf. If you want to take the cable car to leave Fisherman's Wharf, the line is frequently shorter at the end of the Powell-Mason line at Taylor and Bay Streets than at the end of the Powell-Hyde line at Aquatic Park. Of course, there's no guarantee that you won't have to wait. If you are waiting at the turnaround at Powell and Market Streets or at Aquatic Park, you're likely to see some only-in-San Francisco characters. Enjoy them! Back in August, I wrote about a recent visit to Oakland. (Click here to see that post.) Recently we had occasion to spend an afternoon wandering through Oakland's neighborhoods before meeting family for dinner. We strolled along Grand and Lakeshore Avenues and Piedmont Avenue as well as along College Avenue in the Rockridge neighborhood. Grand Avenue was the least interesting of the three commercial districts;although, it is home to the Grand Lake Theater, one of the Bay Area's few remaining movie palaces. Rockridge had the most interesting shops and is home to one of our favorite food emporiums, the Rockridge Market Hall. Here you can find amazing selections of cheese, baked goods, wines, pasta, and other delicious goodies. Feeling the need for some wine and nourishment after our long walk, we stopped in the adjoining Oliveto Cafe for some red wine and nibbles. When it was time for dinner we headed over to the upcoming area near 19th and Broadway for some southern influenced food at Pican All three of us enjoyed our dinners of smoked brisket meatloaf, southern sopes, and low country shrimp and grits. Since southern cuisine is hard to find in the Bay Area, we'll definitely be returning to Pican. As in my last post on Oakland, I can't recommend that visitors to San Francisco make a special trip across the Bay but, if you find yourself in Oakland, there's good food and interesting neighborhoods.